There are, right this very minute, 86 days until Christmas. And that sounds like a lot of time. It really does. But take it from us, it’s not nearly as long as you might think. Fall speeds by on golden wings, and before you know it, you’ll be looking frantically at your list of names and wondering what in the world are you going to get for all of these people? It can be really stressful. Make 2012 different! This can be the year that you start your holiday shopping early, find perfect presents for the folks you love, and do it all without breaking the bank. How is that going to work? You can begin by checking out all of the fine horse jewelry we’ve got on sale. 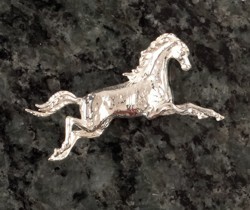 For example, look at this Sterling Silver Leaping Horse Pin. It’s high energy and dramatic style look amazing on an a lapel – a great gift for a boss, colleague, sister, or friend who loves horses. It’s just under 2″ long, made of fine sterling silver and features sapphire eyes. Budget-friendly pricing means you might want to think about getting one for yourself as well! You can save more than 33% on one of our most popular horse jewelry gifts when you act now! 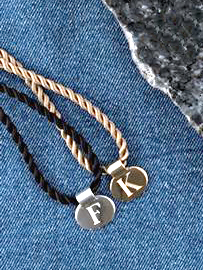 The Sterling Silver Initial Tag Pendant is a favorite of teens and young women. Guys love this pendant too. Every letter from A-Z is available! Wear it with either a thin or thick silk cord (available on the site) or pair it with leather for a more rugged look. The Sterling Silver Initial Tag Pendant is currently on sale for only $25. We’ve also got a 14K Gold version available. Remember, if you’re thinking about giving personalized, engraved items this holiday season, it’s much better to start your shopping sooner, rather than later. Gift certificates are available as well, if you think your recipient would rather pick their own present. Make the holidays easy for yourself this year!